Hello there, today I have the pleasure of guest designing for Kennedy Grace Creations. 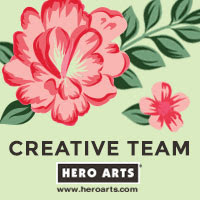 If you haven't heard of them, they are a company based in the US designing and selling wonderful stamps sets, along with sequins and dies. Their floral stamp sets are stunning! 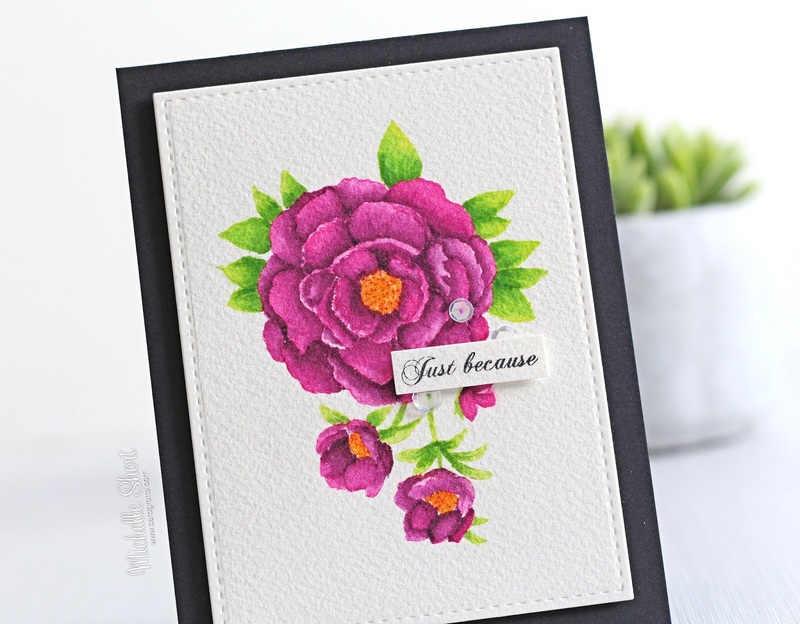 For my card today I am using the Beautiful Bloom - Sweet Rose stamp set. I started off by taking a piece of Arches cold pressed watercolour paper and cutting this with the Mama Elephant Femme Frames rectangle die. I then stamped the rose image on to this using Distress Inks. I used Picked Raspberry for the flower itself and then Twisted Citron for the leaves. The mini cubes are great for selective stamping. The image was then painted using the Distress Inks. As well as the Picked Raspberry for the flower, I also used Seedless Preserves. For the leaves I used Twisted Citron and Mowed Lawn, and for the flower centres I used Mustard Seed and Spiced Marmalade. Once dry, the panel was adhered to an A2 black card base with foam tape. I then stamped the sentiment, from the same set, with black Archival ink on to some more watercolour paper and cut out. This was adhered to the card with more foam tape. To finish off, I added Moonbeams sequins from Kennedy Grace Creations. Isn't that rose beautiful? I am looking forward to colouring it with some other mediums too. For more inspiration using Kennedy Grace Creations products, please head over to their blog. Thank you so much for visiting me today. I hope you have a great week! This is fantastic, so vibrant and pretty. I love that you've layered the watercolour card against a black base. It's so eye catching and feels really stylish. Thanks for the inspiration! Be still, my heart...this is absolutely gorgeous, Michelle! This is SO pretty! Thank you so much for the video! It definitely helps! Great video. I liked watching how you water colored beautiful flower. Lovely card. 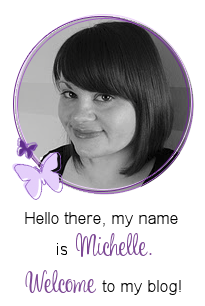 Gorgeous Michelle, stunning colouring and I love it popped up on a black base card too. Beautiful! Stunning...so beautiful. Can't wait to give this a try! Thanks for the video! 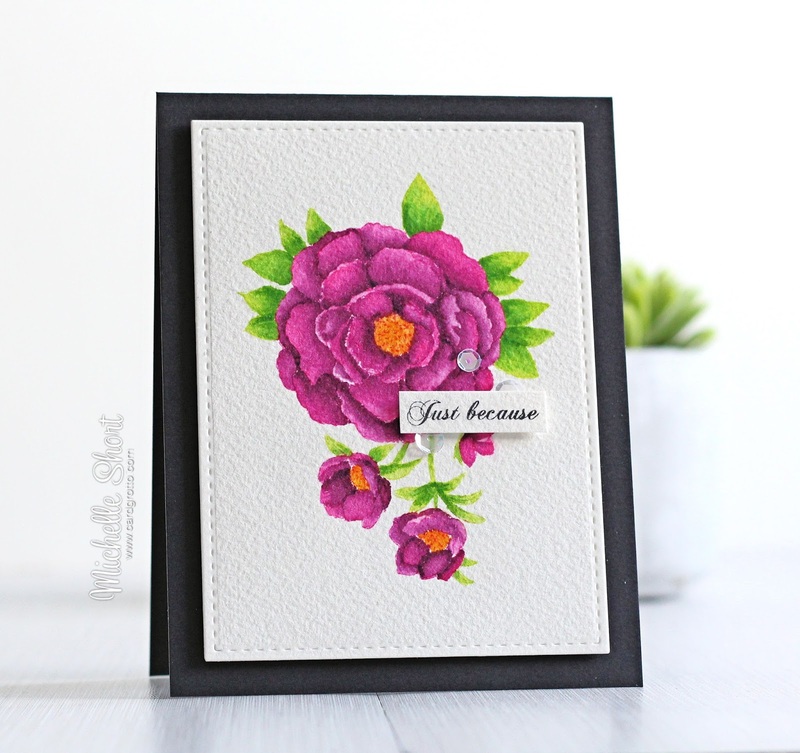 Great tutorial and what a gorgeous stunning card Michelle, so vibrant! !